The Bible imparts spiritual truth by recording how God has acted in history. It starts at the beginning when God created mankind in His image and then confronted the first humans and spoke of a specific ‘he’ who was to come and be sacrificed. This was followed up by the specific event of the sacrifice of a ram in place of Rsi Abraham’s son and the historical event of Passover. This parallels the ancient Rg Vedas where sacrifice for our sin is required and the promise given that this would occur with the sacrifice of the Purusa. These promises were fulfilled in the life, teachings, death & resurrection of the Lord Jesus Christ (Yeshu Satsang). But the promises and their fulfillments are historical. Therefore, for the Bible to be trustworthy in imparting spiritual truth it must also be historically reliable. This leads us to our question: Is the Bible historically reliable? And how does someone know if it is or is not? We start by asking whether the text (the words) of the Bible has changed over time or not. Known as textual reliability, the question arises because the Bible is so ancient. There are many books which make up the Bible, and the last books were written down almost two thousand years ago. For most of the intervening centuries there has been no printing press, photocopy machines or publishing companies. So these books were copied by hand, generation after generation, as languages died out and new ones arose, as empires changed and new powers came to be. Since the original manuscripts have long ago disappeared, how do we know that what we read today in the Bible is what the original authors actually wrote long ago? Is there any ‘scientific’ way to know whether what we read today is different or the same from the original writings of long ago? This question is true of any ancient writing. The figure below illustrates the process by which all writings from the ancient past are preserved over time so we can read them today. The figure shows an example of an ancient document written at 500 BC (this date being chosen solely as an example). The original does not last indefinitely, so before it decays, is lost, or destroyed, a manuscript (MSS) copy of it is made (1st copy). A professional class of people called scribes did the copying work. As the years advance, copies are made of the copy (2nd copy & 3rd copy). At some point a copy is preserved that is still in existence today (3rd copy). In our example diagram this existing copy was copied in 500 AD. This means that the earliest that we can know of the state of the text of the document is only from 500 AD and later since all the earlier manuscripts have disappeared. 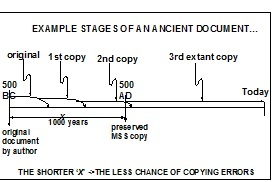 The 1000 year period from 500 BC to 500 AD (labeled x in the diagram) is the period where we cannot check copies since all manuscripts from this period are gone. For example, if copying errors (intentional or otherwise) were made when the 2nd copy was made from the 1st copy, we would not be able to detect them since neither of these documents are now available to compare against each other. This time period before the origin of currently existing copies (the period x) is thus the interval of textual uncertainty. Consequently, a principle that answers our question about textual reliability is that the shorter this interval x is the more confidence we can place in the accurate preservation of the document to our modern day, since the period of uncertainty is reduced. The original writing had either been writing about Joan OR about John, and the other of these manuscripts contains a copy error. The question is -Which one has the error? From the available evidence it is very difficult to determine. 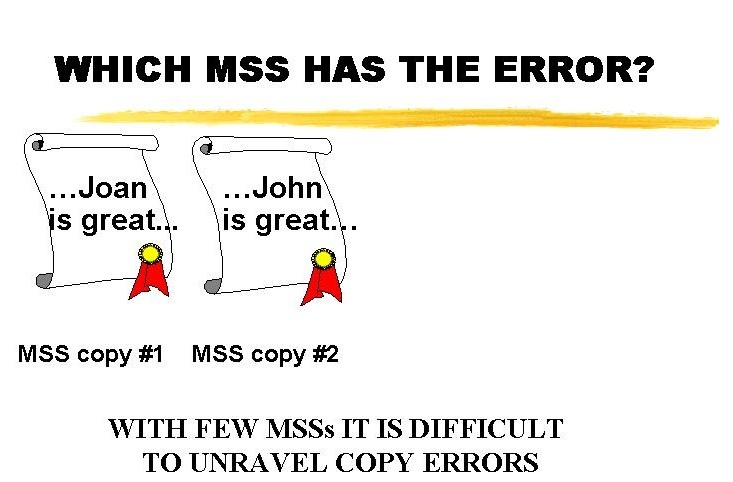 Now it is easier to deduce which manuscript has the error. 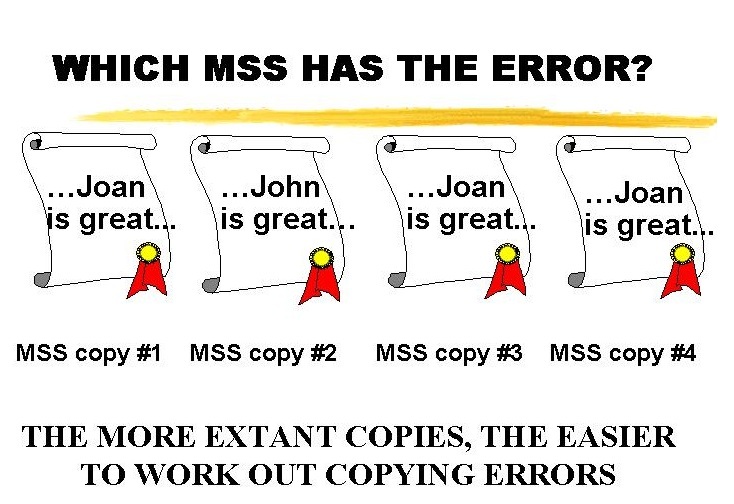 It is more likely that the error is made once, rather than the same error repeated three times, so it is likely that MSS #2 has the copy error, and the author was writing about Joan, not John. This simple example illustrates a second principle we can use to test manuscript textual reliability: the more existing manuscripts that are available, the easier it is to detect & correct errors and to determine the words of the original. counting the number of existing manuscript copies. Since these indicators apply to any ancient writing we can proceed to apply them to both the Bible as well as other ancient writings, as done in the tables below. These writers represent the major classical writers of Western history – the writings that have shaped the development of Western civilization. On average, they have been passed down to us by 10-100 manuscripts that are preserved starting only about 1000 years after the original was written. The other great epic, the Ramayana, is considered to have been composed around 400 BC but the earliest existing copy, from Nepal, is dated at the 11 century AD (reference link) – giving an interval from original composition to earliest existing manuscripts of about 1500 years. There are several thousand existing copies of the Ramayana. These have extensive textual variations between them, especially between those of North India and those of South India/South East Asia. Scholars have grouped the manuscripts into 300 different families based on textual variations. This is significant since these manuscripts come from the early period when the followers of the gospel were not in power in a government, but were instead subject to intense persecution by the Roman Empire. This is the period when the gospel came to South India, to Kerala, and here too the community of gospel followers were never in a position of power through which a king could manipulate the manuscripts. The figure below illustrates the timeline of manuscripts from which the New Testament of the Bible is based. Thus the text is 99.5% common across these many manuscripts. When we compare this with, for example, the textual variation in the Ramayana, the permanence of the text of the Old Testament is simply remarkable. Timeline showing how the Old Testament manuscripts of the Bible have not changed from the Masoretic to the Dead Sea Scrolls even though these are separated by about 1000 years. What he is saying is that to be consistent, if we decide to doubt the textual reliability of the Bible we may as well discard all that we know about history in general – and this no informed historian has ever done. We know that the Biblical texts have not been altered as eras, languages and empires have come and gone since the earliest extant MSSs pre-date these events. The Bible is a reliable book. This entry was posted in Common Questions and tagged Bhagavad Gita and bible, ramayana and bible, reliability of Bhagavad Gita, reliability of Bible, reliability of Ramayana on 04/29/2014 by [email protected].